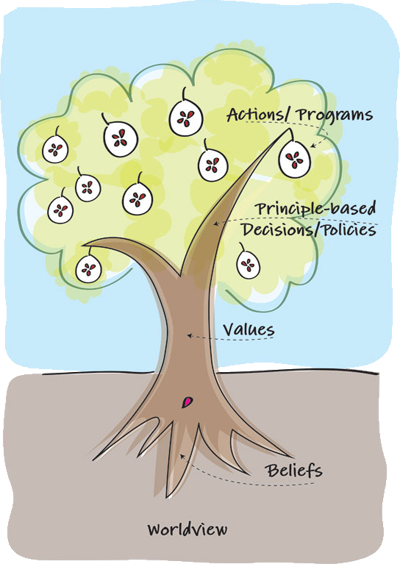 YWAM’s Belief Tree is a model that is currently being taught – and thought about – at some discipleship training schools. Let’s see if I can get down the basics of it in 5 minutes WITH you remembering something useful about it (let me know if that worked, by the way). What do you consider to be true? In your worldview, you typically don’t have to use your brain. Stuff falls down. When it comes to your beliefs, you use it. Somewhat. What do you think is good? Stuff that you consider good in your heart. Of these two: chocolate is good and broccoli is good, it’s the first one. What do you think is (the) right (thing to do). If your worldview, beliefs, values and principles line up, you’ll produce good fruit. If they do conflict at some level and degree, it will result in problems. Ask WHY to go deeper, and ultimately end up with the worldview. Ask SO WHAT to go up and ultimately discover the result. And one bonus question: How do you change your worldview? Let me know if you can answer that.